These treats are probably among the most nostalgic and delicious Christmas time desserts for me. I distinctly remember my mom making these every year, making them with her, and of course eating them until I either had a sugar headache or was full….whichever came first! As I got older I figured out that this is no family recipe or trade secret. I found the exact recipe my mom gave me on the back of a marshmallow package (they just called it something way less appealing). This did not discourage me at all, it did not change how it tasted, it didn’t take away the nostalgia, and it definitely didn’t change the fact that, to me, this is (and always will be) my mom’s recipe. I’m passing on the tradition of course! After I made these the other week I kept finding my two year old daughter with one in hand. I still don’t know how she was managing this since they were on the counter and she is still short…oh well, I was just glad to see that she liked them too! P.S. 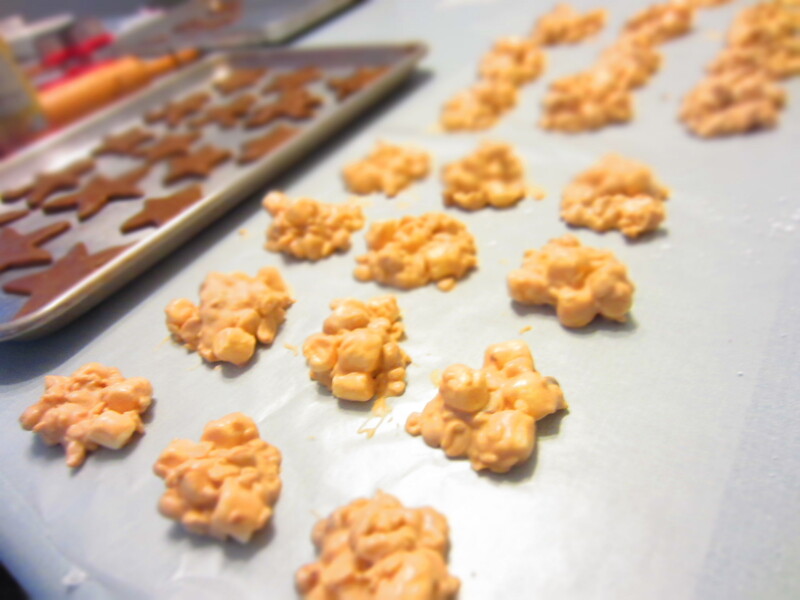 don’t be discouraged about this recipe being called candy….THESE ARE SO EASY TO MAKE! Seriously, you melt vanilla-flavored almond bark, add in peanut butter until combined and throw in the rest of the ingredients. That’s it!!! Seriously, it’s so easy. Also, these are not only a Christmas time snack. It probably isn’t something you would want to make in the summer time if it’s going to be served in a hot place where they can melt, but I promise, these taste great any time of the year! Place candy coating in the top of a double boiler; bring water to a boil. Reduce heat to low; cook until coating melts. Or melt coating in the microwave in 30 second increments, stirring after every time. Add peanut butter into melted candy coating, stir until smooth and combined. Add remaining ingredients and peanut butter mixture in a large bowl, stirring until evenly combined. Drop by teaspoonfuls onto wax paper. Cool completely. Will make about 6 1/2 dozen. (I usually make these much larger but I still get at least 3 dozen out of the this recipe).